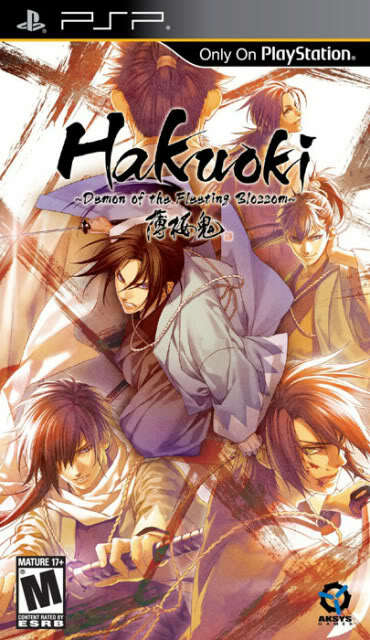 Hakuoki ~Demon of the Fleeting Blossom~ Awards | It's a wonderful world! Just imagine my reaction when a friend told me that there is actually an English translation of the otome game Hakuoki for the PSP. I was so surprised that there is actually A PSP OTOME GAME TRANSLATED IN IN ENGLISH! I just recently learned of Hakuoki when I was searching for anime adapted from an otome game. It was on my to watch list but I never thought that the game was actually translated in English! (Thanks to the common knowledge of the “Maiden’s woe” – that games for girls are not translated in English). Anyway, ecstatic as I was of the news, I immediately went out to get the game.~ Fortunately, they have a copy!! Yay! Anyway, I really want to write a review of the game, or perhaps just a story summary of each route, but with all the school stuff I need to do, I decided to just do this short “awards” post ^_^. Of course, this is an otome, and with all those handsome guys around you, you will have a guy you think is the best among the rest! He may be the silent guy, the loud guy, the leader, the prankster – an otome has a lot to offer! There’s no competition in this one; Just one look and the award goes to Souji’s kiss ♥. It’s the Shinsengumi officials in their blue uniforms! I just love this CG; so much feels! Just this picture and you have all of what Hakuoki can offer. Second place will probably go to the Normal Ending. But I don’t want Chizuru to be alone! Definitely Souji Okita’s! Well yeah, his route was the most branched out from the canon route (Hijikata’s), he is damn so forgotten in every other route, both his good and bad endings are depressing, but hey, this is an otome game and otome games are supposed to be romance games and Souji’s route has the most romance! ♥ (their kiss!) 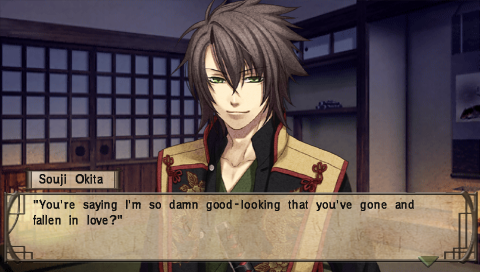 (sorry, Sanosuke Harada fangirls :) His route is my second best though). Souji’s route has a lot to brag too because he has lots of possible endings :D. It’s also the only route that explained more of Kaoru Nagumo. But I’m looking for a happily ever after ending, so this route’s ending is my major problem :O Still, it’s my favorite route!!!! Only six awards for now! I really really want to play the game again and write a post about each route! Chikaze's route was… too short. It took me a while to get into his route and yet at his ending I felt that there should be more on his story.